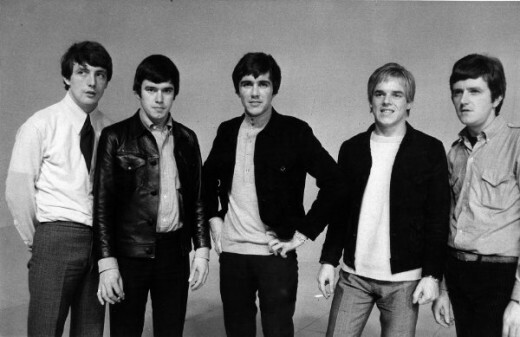 The Dave Clark Five exploded onto the Worldwide music scene at the end of 1963 when they released the single “Glad All Over.” It’s one of those singles which once heard, can never be forgotten – exciting, joyous, catchy and a unique thumping sound with the drums almost as the lead instrument. It was the bands sixth single in one and a half years and hit the number one spot in Britain replacing The Beatles’ “I Want To Hold Your Hand.” In February 1964, in the immediate wake of The Beatles performances on his show, Ed Sullivan invited the DC5 (as we’ll refer to them here) to fly over to perform their hit on live TV. The effect was very similar to the one The Beatles had and the DC5 became big news in America to the degree they spent more time there during 1965 to 1967 than in their homeland since America couldn’t get enough of them. Unfortunately with music tastes and times ever changing at a fast rate, by 1967, the DC5 success train started grinding to a halt. They quit touring and turned their back on the American market becoming basically a studio band making appearances on TV simply to promote and sell their records. The enjoyed a new lease of life in Britain enabling them to continue having hits into 1970. In July 1970, Dave Clark summoned the band to a meeting and informed them that he was breaking up the group. Since the early 70’s, the music of the DC5 became severely restricted, only available on sporadic compilation albums. Not until 2010 did almost their entire work end up being reissued via iTunes. Sadly because most of that music was unavailable for 30 years or so, the DC5’s reputation had suffered to the degree they are almost in danger of being completely forgotten. A strange fate for a band who in their heyday had success rivalling that of The Beatles and The Rolling Stones in America. Therein lies a strange complex story which I’m going to try and unravel as simply as possible. No biography has ever been written and published about the band. Information on them was until recent years extremely sketchy, rehashing old publicity statements filled with hyperbole and severely exaggerated information. At the centre of the entire saga is one man – Dave Clark. A fiercely private man, Clark was a rather unique individual who steered the band to success. At heart, Dave was a businessman with a talent for making money. The DC5 was one such venture created for that purpose. Dave played the drums. He was not the greatest drummer by a long shot, but despite many accusations, he could play effectively. Unusually for groups in the early 60’s Clark’s drum kit assumed centre stage prominence. The band was named after him. They served a lengthy apprenticeship in North London clubs where they built up a large following and heralded as a dynamic exciting live act. With Dave were : Rick Huxley (Bass), Lenny Davidson (Guitar), Denis Payton (Sax) and Mike Smith (Keyboards and Vocals) Mike Smith was classically trained and possessed a unique gritty powerful voice. He was charismatic and good looking but… he didn’t have enough confidence within himself to admit how good he was. Enter Ron Ryan. Ron was a songwriter who became close friends with Dave Clark. Dave was eager to make the band successful, but there was one problem – he didn’t have any real musical training nor talent. So, Dave relied upon the advice of Ron to try and find a sound and song to break the band into the big time. Ron gave them many songs and in late 1962 he told Dave to listen to a single by British singer Doug Sheldon entitled “Your Mama Told Me You Cried In Your Sleep Last Night” urging Dave to copy the sound and style feeling it would be perfect for the DC5. It had a stomping quality and Dave listened. Three singles were released in 1962 to no effect but the final one released in December, Ron Ryan’s “That’s What I Said” was the first time the soon to be popular DC5 style and sound was captured on disc. As 1963 got under way and The Beatles began to become popular, Dave and Ron knew they had to act quickly to get on the beat group bandwagon. Driven by determination, Dave Clark’s business acumen really came to the fore at this time as he assumed total control not just of the band leadership but their management, promotion, production and publishing. In a highly unique move, Dave did a deal with EMI Records which was known as a “lease deal” – this meant that Dave Clark would be responsible for all the recordings and he would lease them to EMI for release. After ten years, all the tapes, ownership and copyrights would revert back to him. This became common practice in the 70’s and beyond but it was unheard of back in 1963. Dave was after all a total unknown at this point yet he somehow managed to strike a nice lucrative deal with the major record company of the time. To strengthen his position, he formed his own publishing company Spurs Music Ltd. He then made deals with the band members and Ron Ryan dictating that every song they wrote from then on, Dave would also be credited as a songwriter. Dave was doing all the business dealings so this was his way of ensuring he would get paid royalties from all the songs. Ron Ryan agreed to this, agreeing it was “fair” that Dave get half the songwriting royalties on songs he was writing. Lastly, Dave then put the entire band on a weekly salary. This meant they could turn professional and earn a steady living whether they were working or not. So with a new record deal under his belt, Dave took the band into the studio to try and make a new hit record to break them. The first EMI single “The Mulberry Bush” stiffed whilst the second “Do You Love Me” made inroads despite one major problem. Being a cover song, word has it that the DC5 recording was leaked and another band Brian Poole and The Tremeloes heard about it then dashed into the studio to make their own version which was rushed out to compete against the DC5’s. Brian and co ended up with the big hit. Dave Clark was furious and demanded that from then on, all sessions would be conducted in secrecy to prevent any possible leakages. This was to prove an ideal smokescreen since Dave Clark was not the drummer on most of the DC5’s records. Dave would be seen miming and smiling on TV shows hammering away at the drums and winning acclaim and recognition for his drum work but the reality was until 1966 the drumming heard on the records was played by a renowned session drummer Bobbie Graham. The reason for this? Bobbie was a pro and could work quickly. Studio time cost money and Dave wanted to be producing the records taking charge, so having a session drummer enabled him to get on with getting the sounds he wanted and the recordings done quickly and cheaply. December 1963 saw the release of “Glad All Over” – a Mike Smith composition and the DC5 reached number one in Britain and were now well on their way. The follow up “Bits and Pieces” had a similar sound and formula, insanely catchy. Ron Ryan wrote it but was bewildered when he saw his name was missing from the songwriting credits. Dave told him there was nothing sinister about this and he would get his royalties anyway. The band took off in America and several years of non stop touring, promotion and record making got under way with hit singles all over the World. Unfortunately the situation with Ron Ryan took a drastic turn for the worse. Having had two raucous hits, Ron felt the band should change style and release a ballad to prove the band were versatile and could appeal to more than just teenagers. He gave them a song called “Because” – Dave was furious, saying that a ballad was not suitable as an A’ side so in Britain, he shoved it away on the B’ side of the rocker “Can’t You See That She’s Mine” and once again, Ron’s name was absent from the credits. In America, the record company loved “Because” and released that as an A’ side which Dave could do nothing about and it became a monster hit. That song is a timeless classic much loved to this day, but Ron Ryan has never been credited for it. October 1964 saw the band releasing the frantic “Anyway You Want It” – a powerful surging production laden with interesting echo effects. It was Ron Ryan’s last song for the band. Still having not been paid let alone credited for the hits he had written for the band Ron confronted Dave demanding to know what was going on. To his horror, Dave was in total denial and Ron was gutted to see that a man he considered to be a close friend had become a complete control freak and a very different person to the one he befriended some years earlier. Ron considered suing Dave but decided not to because he was pals with the rest of the band and feared that litigation would affect them and their success. In the end, Ron and Dave came to an “agreement” and Ron moved away to concentrate on his own career. Meanwhile, Dave told the rest of the band they were now forbidden to have any contact with Ron. It has been galling for Ron ever since to read and hear interviews with Dave Clark boasting about how he had written the song, a song that Ron points out Dave didn’t like but has made a very nice living from at Ron’s expense. To this day Dave Clark is credited as sole songwriter despite not having written a single note of it. 1965 saw the DC5 make a movie, “Catch Us If You Can” aka “Having A Wild Weekend” in America. Fans expected this to be like The Beatles’ movies but instead were presented with a moody thought provoking film which took a jaded look at fame and advertising. Dave being the leading mane was stiff and unconvincing as an actor – a fact he readily admitted at the time – but despite that, he had been bitten by the acting bug and would later return to it. Either way, the hit machine kept ploughing on. The bands image was extremely clean cut for the time and they had a very safe conservative image. This endeared them to Mums and Dads to the detriment of more rebellious youngsters who looked upon them as being “square.” Dave was pulling all the strings. Every member had to obey his orders – he told them what to say and wear in public. They all gladly went along with the ride. They were making money, were successful so why question a formula that was working? 1966 saw cracks beginning to appear in the bands armour. None of their singles that year charted at all well in Britain which was a shame since “Try Too Hard” released that March was an interesting unusual number that proved they were keeping up with the times admirably. But in America it was a never ending blur of TV shows, concerts and promotion. The money kept rolling in making Dave Clark one of the richest men in the industry. However, with the war in Vietnam raging on, the rise of the hippie movement, drugs and trends changing rapidly, the DC5 began to look a little out of step. Dave knowing that times and tastes were changing decided it might be wise to bring the DC5 venture to an end. With this in mind, he had Mike Smith cut a solo single with session men, “You Got What It Takes” a perfect showcase for Mike’s vocal talent. However, Mike had no interest in going it alone, since he was happy with how things were so the single was released as one by the DC5 and it was the final big hit they were to enjoy in America. Tired of touring, Dave decided to retire the band as a live act before audience numbers began to drop. He started looking at new ways of promoting the band so started work on creating a TV special shot on film showing the band performing various new numbers which he could sell to TV companies and keep the bands name in the public eye. “Hold On, It’s The Dave Clark Five!” looks remarkably corny and contrived today but proved popular at home in Britain. With rock and psychedelia proving popular, Dave had a problem on his hands as to where to take the band next. Would they embrace the new movement? They certainly proved they could turn in effective psychedelic tinged rockers, but Dave decided to play it safe. 1967 may had been the year of flower power but the records that were selling the most were by the likes of Tom Jones and Engelbert Humperdinck – the big ballad. So, Dave bought a Barry Mason balled entitled “Everybody Knows” and set about recording it as a single. Unusually he decided that Mike Smith’s voice was not suitable so had each member – including himself – record a lead vocal before deciding that guitarist Lenny Davidson’s plaintive voice was the ideal one. The single shot to number two in Britain. After a string of flop singles, this put the DC5 back into favour in their homeland and from then on, their focus on America ended to concentrate on Britain and various European countries. The follow up, another ballad “No One Can Break A Heart Like You” proved a disastrous choice. The song wasn’t very good and neither was the bands performance so it flopped forcing Dave to abandon the idea of further ballad singles for the time being. September 1968 saw the release of “The Red Balloon” written by songwriter Raymond Froggatt. A cheesy piece of bubblegum pop it gave the world the sight and sound of Dave Clark himself as the lead vocalist. Another hit, this was followed by the similarly styled and quirky “Live In The Sky” written by Mike Smith in an attempt to write some kind of football anthem! The bands adventures with bubblegum pop music though proved them to be a little too contrived and calculated for many peoples’ tastes. The DC5 seemed to disappear for much of 1969. Major change was in the air as Dave Clark decided to enrol at an acting school meaning the band ceased to be a full time proposition. When they did return it was clear Dave had no real clue as to what the band should be doing. October 1969 saw the release of a cover of Jackie De Shannon’s “Put A Little Love In Your Heart” a hippie like anthem yet just one month later came another single “Good Old Rock and Roll”a medley of old rock and roll songs. Dave was trying to gauge which movement to follow since hippie music was still selling and in reaction against that there was a revival of interest in late 50’s rock and roll music so Dave was trying to stick fingers in both pies. Of the two, the rock and roll medley sold the most in Britain taking them back into the top ten. 1970 – a new decade, and in February, the DC5 released another hippie like anthem single “Everybody Get Together” which was popular in America by The Youngbloods. Having flopped in the UK, Dave thought he could bag a hit with it and was proved right. When they performed it on BBCTV’s Top Of The Pops, it made for a memorable sight as Dave enlisted many friends and colleagues from his acting school to surround the band singing along with the never ending mantra like chorus that closed the song. There was a definite feeling that this was a “goodbye” to the 1960’s, the ending of an era. It was the bands last top ten hit. Dave followed it with the slow dreary ballad “Julia” which was ignored. The following month in June 1970 he released another cover, this time of the old Jerry Keller hit “Here Comes Summer” which charted lowly. As it did so, Dave called the band for the meeting at which he informed them the DC5 would be no more. Straight away, the salaries came to an end. For Rick, Lenny and Denis, the money had stopped and they would never receive any more royalties from their time in the DC5. It is here that everything starts getting somewhat confusing. Dave and Mike Smith teamed up with singer Madeline Bell and session musicians for a new venture called “Dave Clark and Friends.” Ever the canny businessman, Dave put this venture together in order to fulfil the EMI contract which wouldn’t end until 1973. Dave also had a whole load of unreleased DC5 material in the can and he began dipping into them to release singles under the new name. None of these singles were hits and to this day, nobody really knows for certain which songs were actually by the DC5 or Dave Clark and Friends. A self titled album appeared in 1973 which confused the issue even more since the 1969 DC5 single “Put A Little Love In Your Heart” was featured along with a handful of other DC5 outtakes mixed up with newer recordings. The EMI contract fulfilled and not having had any hits for the last couple of years, Dave Clark and Mike Smith went their own ways. Dave concentrated on his business empire whilst Mike teamed up with former Manfred Mann vocalist Mike D’Abo for a one off album as a duo before seemingly disappearing altogether from the scene. Mike Smith did much work in recording advertising jingles which kept him afloat before suddenly releasing a brand new one off single – a DC5 medley – in the mid 80’s which proved he was still in fine voice. 1973 saw all DC5 product revert back to Dave Clark himself and suddenly none of the work was available any more. In 1978 Dave did a deal with Polydor Records which saw the release of a greatest hits album “25 Thumping Greats” which sold rather well, but that was it until 1993 since no more DC5 music was available. You couldn’t buy any new product of their music at all in the 1980’s. This was made all the more bizarre since Dave Clark was cashing on on a 1960’s revival by selling videos of the old British pop TV show “Ready Steady Go!” He sold them to commercial TV and these shows would feature interludes showing DC5 performances from American TV. Fine, but you couldn’t buy any of the records! Singer Sandie Shaw discovered she was featured on one of Clark’s video compilations and confronted him about it since he hadn’t asked for permission and furthermore he wasn’t paying her or anybody royalties for their footage. Shaw hammered out an agreement ensuring the artistes would be paid a basic royalty, but it left a nasty taste how Clark assumed he could get away with releasing such material and claiming all monies for it. Mind you, he had plenty of practise. Dave then surprised everybody with a musical show in London called “Time” which featured a hologram of Sir Laurence Olivier and a soundtrack album. From that, a Julian Lennon cover of “Because” – writing credited solely to Dave of course – was released as a single becoming a hit. 1993 saw Dave strike new deals with EMI and a new company in America to finally start releasing the DC5’s work on Compact Disc. A 2 CD compilation in America and a single CD distillation in Britain sold well considering the music hadn’t been available for many years, but unfortunately, Dave was deluded, convinced it would sell millions. When they didn’t in a fit of pique, planned reissues and a boxset never happened and soon once again, once the CD’s were deleted, the DC5’s music was unavailable. In 2003 came a major surprise when Mike Smith returned with a live show which he toured in America. His first live dates in over 30 years, Mike was stunned to discover he hadn’t been forgotten and the tour went really well. He was still in fine voice and he began making plans to move to America to enable further tours. Unfortunately this tour did have an ominous shadow over it. Before the tour, Dave had contacted Mike informing him he was strictly forbidden from using the DC5 name to publicise the tour. If Mike used their name, then Dave would see him in court. Shortly after the tour, tragedy struck. Mike had a fall outside his home in Spain which broke his back and left him paralysed from the neck downwards. He was flown back to England where he required 24 hour a day hospital care. Sadly, his planned comeback was over and he spent the final years of his life confined in hospital where he slowly began to regain movement and mobility. He and Ron Ryan who he hadn’t seen in over 40 years resumed their friendship. In December 2006, Denis Payton DC5 saxophonist tragically died of cancer. In January 2008 after 4 years, Mike Smith was finally allowed to leave the hospital. His new home had been customised and he had a special electric wheelchair to help him get around. He attended a concert by Bruce Springsteen where he was treated as guest of honour and Mike loved every second of the experience. Though severely restricted, he was glad to have gotten back a little freedom. The DC5 were to be inducted into The Rock and Roll Hall Of Fame in March, an accolade that thrilled Mike and he was determined to travel to New York for the ceremony. Sadly, on 28th February 2008, Mike died after complications set in. A few weeks later, actor Tom Hanks inducted the DC5 into the Hall of Fame which saw the surviving trio of Dave Clark, Rick Huxley and Lenny Davidson together in public for the first time in 38 years. 2010 saw Dave Clark start releasing the DC5’s back catalogue as downloads on iTunes. Unfortunately much to many fans fury, Dave took the opportunity to rewrite the bands history by altering the running orders of the original albums, removing tracks and inserting others that had been recorded much later, and there was one final curious observation – the handful of tracks that had been credited to Ron Ryan were nowhere to be seen. An official book and DVD history of the DC5 was mooted by Dave in 2008 but so far we have yet to see any trace of them. It’s a sad sorry shame that the DC5 who gave much pleasure to millions of people back in the 1960’s have been surrounded by so much intrigue and smokescreens orchestrated by Dave Clark himself. By keeping their music unavailable for so long, the band slowly began to be overlooked and forgotten and though the Rock and Roll Hall of Fame honoured them, there are a great many people now who have heard of The Beatles, The Rolling Stones, The Kinks and many other big acts from the time, but not the DC5. This entry was posted in Yankees and tagged The Curious Story of The Dave Clark Five by edb23. Bookmark the permalink.